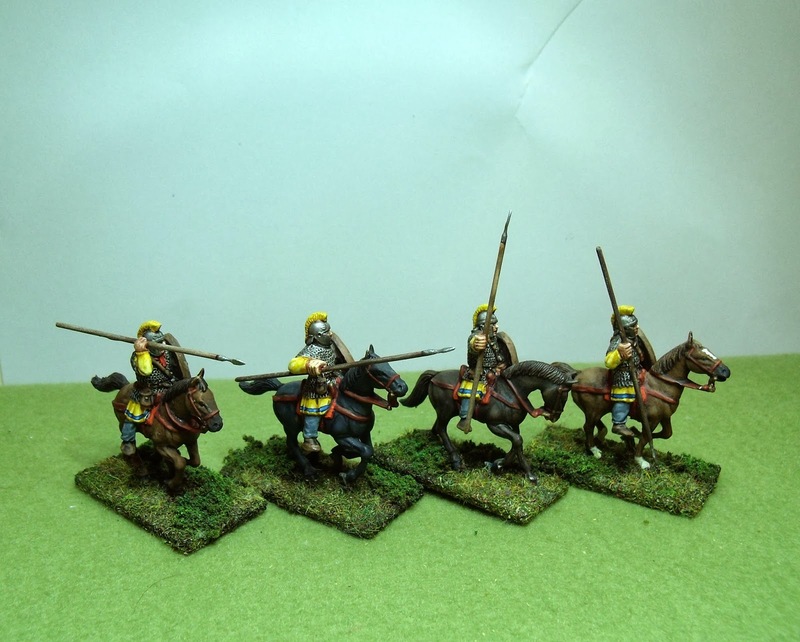 The Dux Brit rules allow for the British player to acquire a unit of heavily armoured shock cavalry as an additonal elite group. 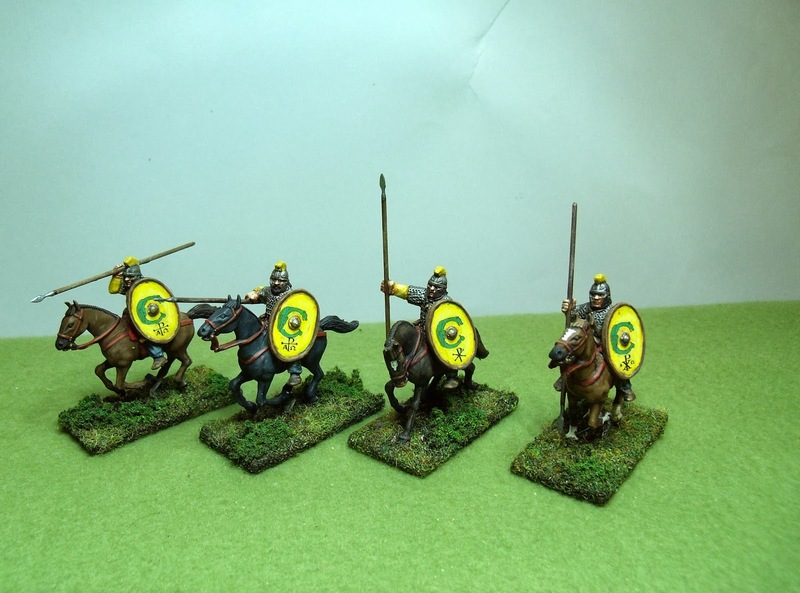 These would also (I guess) serve as hearthguard for a Saga Strathcylde force. In military terms these are the ultimate in Dark Ages conspicuous consumption. Only the richest, more powerful, best connected warlord is going to have access to a unit of these. And I don't even want to THINK about the effect of a unit of these hitting the flank of some poor bloody infantry, under the influence of Carpe Diem, A Strong Arm, Aggressive Charge or Artorius and Lancelot leading them with Hero of The Age... Best pray to Woden, boys, because nothing on earth is going to save you! 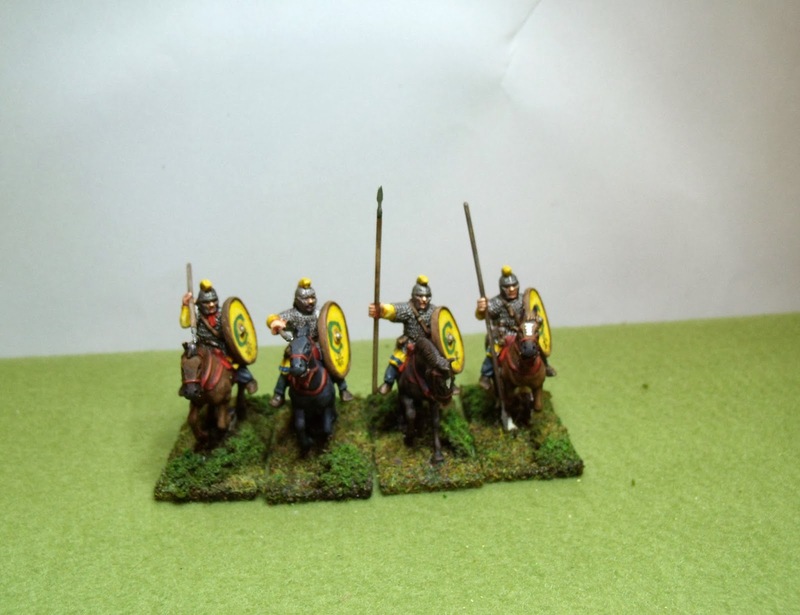 These are Gripping Beast Late Roman armoured cavalry, that I bought on Ebay for a song. The figures appear to be some of the Beast's older offerings, with shields cast in place. I don't get on well with cast-on shields, as I struggle to paint the details on the rear of the shield and the adjacent bits of figure, but I think I did OK. The figures have a nice variation of poses - four quite different stances, all nice and natural. The faces are characterful and reasonably varied, including a beardy one, and all four show sufficient subtle differences in equipment to make them look like individuals. They required some minor cleanup of joint seams, but carried no flash at all, as is pretty much the norm for GB. Although they came with lances, I replaced the lead ones (which bend when you look at them) with some I made from steel rod. Overall I was as pleased as punch with this buy. The minor downside was that they came without horses, but for the price it was still so worth it. A scratch around revealed some possible sources for mounts, but I struck lucky again, and managed to cop some Conquest Games Norman horses from a helpful chap on LAF. Now, these might not be perfect horses for the job. They represent animals that are frankly a bit too good a quality for Sub-Roman purposes. The standard of post-Roman horse flesh might not have been anything like as well-bred as this, although there are suggestions (again, I'm not sure how much evidence backs them up!) of imports of cavalry mounts from the continent. However, these were readily available and thanks to the seller's fairness, very reasonably priced, so they'll do for me. The horse models come as three-piece kits, need very minimal pre-assembly cleanup and go together without difficulty, although mine did need a bit of filler. The two different halves and separate head construction method gives plenty of variation. To anyone used to plastic scale models, these are a doddle. The bridles, I thought deserve a special mention - moulded accurately (for Normans, of course, but near enough for me) carefully and about as delicately as is possible. One really good thing is that the horses are kitted without saddles, but with blankets. This makes them very suitable for the sort of generic use I've made of them, and probably isn't an accident on the part of the sculptor. 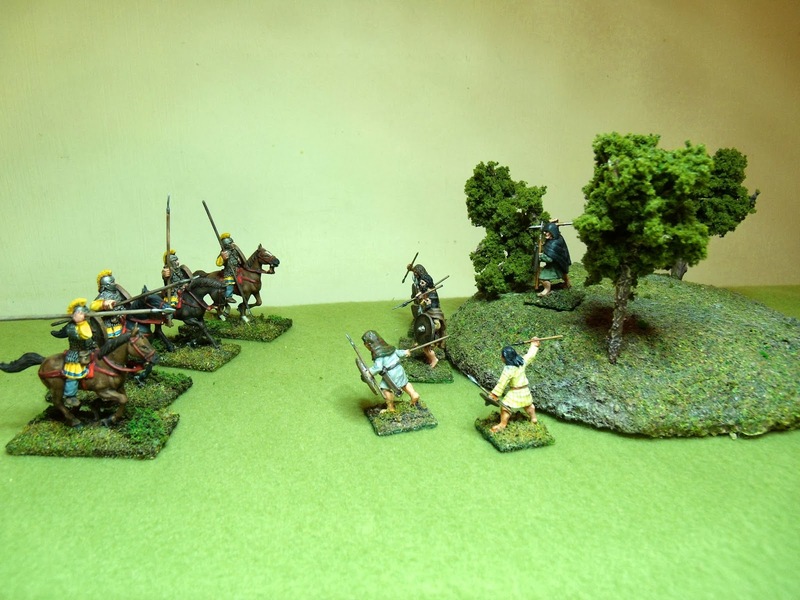 Anatomy and posing really is first class, and even if they are a bit good quality for Sub-Roman Britain, these really are nice figures - recommended! Other side. I LIKE these horses! Now, unsurprisingly as they weren't sculpted to go together, the horses and riders need a bit of work to make them fit convincingly. The Gripping Beast riders have their four-horn saddles moulded in situ, and by reaming out the bottom of the saddle and the sides of the horse, you can get a nice matchup between the two. A bit of greenstuff here and there makes the fit perfect. I added one strap to the back of horse, under the tail. I'm not sure if Roman saddles of this type had the double girths as cast onto the horses, but I left them in place anyway. As super-elite fighters (hearthguard AND mounted? They're not going to have much of an attitude are they?) I went with bright colours (nearly garish, if you like) for clothes, and bright painted shields, with some home-made "monster" decals for good measure. Upon due reflection, I think the Picts leaving the woods to fight these guys might have been misguided. My money's definitely on the cavalry here on the flat! They're looking good. The riders seem to fit their mounts quite well. Nice idea. A good addition to your forces! !